The Minford Falcons defeated the Oak Hill Oaks in Minford Friday night by a final score of 39-0. Coming into this week two matchup, the Minford Falcons and the Oak Hill Oaks were undefeated at 1-0. After last season’s 14-7 final in the Oaks favor, many were expecting another good game from these two teams. If you were a Minford fan, the excitement started early with a 70-yard rushing touchdown by quarterback Kelton Kelley on the game’s first play. The extra point missed wide, giving Minford a 6-0 lead early in the contest. Coming off the momentum of the offense from the previous drive, the Falcon defense would come out and force a fumble putting their offense just 19 yards away from the end zone in excellent field position. After a couple of short runs and receptions, head coach Jesse Ruby and the Minford offense found themselves facing a 4th and goal on the one yard line. They would elect to go for the endzone with a quarterback sneak up the middle by Kelton Kelley which successfully put them up 13-0 after the extra point. This gave them all the offensive momentum and had the Falcons looking very confident early on. On the following drive, the Oaks would make it to the Minford 49 only to attempt a punt. On the Oak Hill punt, there was a roughing the kicker call which would give them a first down. This appeared to be the Oaks chance to get back into the game, but they would ultimately end up punting a few plays later after a few unsuccessful short running attempts. Starting the drive on their own 11-yard line up two scores, the Minford offense would go on to score after a 76-yard touchdown reception made by Ty Wiget, keeping the momentum in Minford’s favor and extending their lead to 20-0 after the made extra point. The Oak Hill offense couldn’t avoid trouble the following drive, giving up a fumble on their own 47 which gave Minford good starting field position once again. The Falcons would once again capitalize on the turnover, capping off the ensuing drive with a three yard touchdown run by Elijah Voglesong. The extra point was no good, leaving the score to be 26-0 in Minford’s favor after the first half of play. The scoring didn’t stop after halftime, however. Minford kept their foot on the gas, driving down the field with a series of passes, ending on a 32-yard reception by Elijah Voglesong from Kelton Kelley. The touchdown would put Minford up 33-0 after a converted extra point, ruining any hope of an Oak hill come back in the late stages of the game. 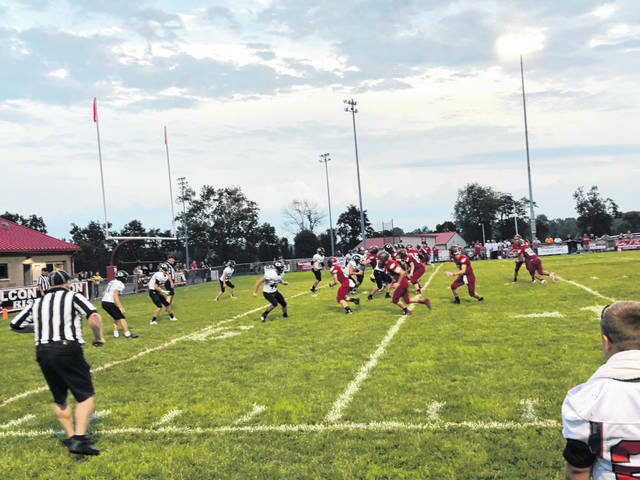 With a 4th quarter running clock, Minford struck another long play, connecting on a 50-yard pass from Voglesong to Matthew Risner. A few plays later, the Falcons would end the game on a 25 yard rushing touchdown by Voglesong, giving them a 39-0 win and pushing them to 2-0 early in the season. After the game, Ruby spoke as to why his group was so successful against an Oak Hill team which beat them the previous season. “I thought our coaching staff put together a great game-plan offensively, defensively, and the players just went out there and executed” said Ruby, “Oak Hill has a very good team, I’m sure they are going to go out and win a lot of football games this year, we just executed really well today”. The Falcons will host the Nelsonville-York Buckeyes in their second straight home game next Friday night. Kickoff for that game is slated for 7:30 p.m.